Notre Dame Stadium was packed with fans for the 1937 season finale against the Fighting Irish’s arch rival, the University of Southern California. With the score tied as the game approached the final minutes of the fourth quarter, the Irish and Trojans laboriously attempted to break the deadlock. Suddenly, the long-awaited breakthrough came for the Irish when fullback Mario “Motts” Tonelli, wearing number 58, made a 68 yard run toward the Trojan goal line, reaching the Trojan 8-yard line. On the next play, Motts ran the ball in for the game winning touchdown amidst the cheers of a 40,000-strong crowd. Little did Tonelli know that his outstanding performance in Notre Dame Stadium against Southern California may have helped to save his life in the turbulent years to come. Mario George Tonelli was born the son of Italian immigrants in the Chicago suburbs. At age six, Mario suffered severe third-degree burns over most of his body when a trash incinerator fell on him. Despite the despairing news from a doctor that Mario may never walk again, Mario’s father devotedly cared for his son, assisting in his recovery. Within months Mario was able to walk about unhindered. Years later, while enrolled at DePaul Academy in Chicago, Tonelli excelled in basketball, track, and football. As result, he was eagerly recruited by a number college coaches. Notre Dame coach Elmer Layden visited his home in an attempt to convince him to play for the Fighting Irish instead of accepting a lucrative offer from Southern California. He decided to attend Notre Dame and played on the varsity football team for three years. In 1939, after the College All-Star game, Tonelli accepted his gold class ring with his initials and graduation date engraved on its underside. Employing his skills as a football star, Tonelli joined the Chicago Cardinals in 1940. However, feeling a sense of duty to serve his country, he decided to enlist in the Army at the end of the season. 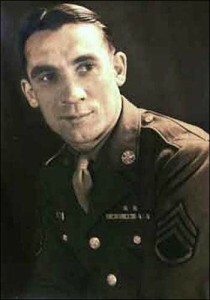 Reporting for duty at Camp Wallace, Texas, in March 1941, Tonelli remarked to a reporter that he would be able to use his Army training exercises as a football coach after he finished his service. By July, he was stationed at Fort Bliss, Texas, and assigned to the 200th Coast Artillery, and anti-aircraft artillery unit of the New Mexico National Guard. Tonelli though that after one year of service he could return home to his new wife Mary and rejoin the Cardinals for the 1942 season. Unfortunately, things did not work out exactly as Tonelli hoped. On 7 December, 1941, the now SGT Tonelli was stationed at Clark Field on Luzon, the main island of the Philippines. The next day, as he exited the mess hall, a swarm of Japanese planes commenced bombardment of Clark Field. Unable to reach his anti-aircraft gun, he grabbed a nearby Springfield rifle and fired fruitlessly into the horde of enemy aircraft until the Japanese planes departed. Soon after the initial assault, Tonelli joined the rest of the American and Filipino forces in their withdrawal into the Bataan Peninsula. For five months, Tonelli and his fellow soldiers fought valiantly against the Japanese juggernaut while their supply of food, medicine, and ammunition dwindled. On 9 April, 1942, the weak, starving, and exhausted American forces surrendered to the Japanese. On this day, Tonelli began his 1,236 day ordeal as a prisoner of the Japanese. The following day, he found himself in what would become known as the Bataan Death March, a sixty-plus mile trek north to the town of San Fernando, where prisoners were then herded in steel cattle cars slowly transported to the ad hoc prison, Camp O’Donnell. Denied food, water, and medical aid while on the march, the POWs were also striped of their valuables by their captors. Fatigued by the months of fighting and his recent capture, Tonelli neglected to hide his gold Notre Dame ring, which he still wore proudly on his finger. A Japanese guard came by and pointed to the ring. Tonelli refused to hand his precious football memento over to the guard. Annoyed with his insolence, the Japanese soldier threatened to strike him. Tonelli finally decided to turn the ring over as a friend quietly warned him that no ring is worth dying for. As the guard left him, he knew he would never see his class ring again. A few moments later a Japanese officer stepped up to Tonelli and asked in perfect English, “Did any of my men take anything from you?” Dazed and confused, he responded, “Yes, he took my Notre Dame ring.” The officer handed him his ring back and cautioned him to hide the ring so it would not be taken again. After a word of thanks from the grateful prisoner, the officer explained, “I was educated in America at the University of Southern California.” The officer stated that he knew about Tonelli’s game winning play against the Trojans in the final game of the 1937 season. “I know how much this ring means to you, so I wanted to get it back to you.” With that, the officer turned and walked away. For Tonelli, the brief, surreal moment was soon interrupted by the realities of war. During the rest of his trial as a POW, Tonelli carried the ring with him, concealing it from the eyes of his captors. As he pressed northward toward San Fernando, the POWs were denied water and food. Desperate for water, he and his fellow soldiers laid their shirts out on the ground at night to collect the morning due so they could quench their thirst and temporarily relieve their mind of their horrid condition. The reluctant prisoner later recalled a repulsive image he saw that summed up the brutality of the march, a decapitated head of an American soldier covered with flies sitting upon a pike. By the time the POWs reached the railroad at San Fernando, about 700 Americans had died of ill treatment. Crammed into steel cattle cars and shipped north to Capas, Tonelli and the POWs marched another eight miles to their internment at Camp O’Donnell. With the rampant rate of death among the malnourished and disease ridden prisoners, he soon found himself digging graves for the accumulating dead. He quickly came down with several maladies himself, including scurvy, beriberi, and malaria. After seven weeks at Camp O’Donnell and another 1,600 dead American POWs, the Japanese moved the POWs to Cabanatuan. Coerced into performing slave labor in order to receive a barely sufficient food ration, Tonelli toiled long hours while at Cabanatuan. After performing this duty for a year, he finally moved to a rice paddy near Mindanao where he slaved on rice farms until the summer of 1944. During this time, he contracted an intestinal parasite that caused him severe abdominal pains. Not giving into the torment and despair all around him, he would look at his ring every day and rejuvenate himself with hope for better days ahead. The weary prisoner later recalled that this hope allowed him to live through the darkest days of his internment. That summer Tonelli and his fellow prisoners saw America planes flying overhead daily. One day, a plane flew in close to the prison and dropped a carton of cigarettes that had a handkerchief tied on as a parachute. Writing scribbled on the parachute read, “Hostilities have ceased. Will see you soon.” The next day, the prisoners looked up at a sky full of 55-gallon drums attached to parachutes. Tonelli recalls opening the drums and finding all sorts of food, medicine, cigarettes and other goodies. He and the rest of the prisoners ate themselves sick. After forty-two months as a POW, Mario Tonelli weighed ninety-eight pounds on the date of his liberation. He had previously been a strapping 210 pound fullback. Eager to reunite with his parents and wife Mary, he boarded a train for Chicago as soon as he arrived in San Francisco. Although still physically weak and suffering from the aftermath of malaria and other tropical diseases that would plague him for the rest of his life, Tonelli was signed onto the Chicago Cardinals during the 1945 season and played in one game against the Green Bay Packers. In 1946, showing his desire to serve others once again, Tonelli entered local politics and remained employed in local government until he retired in 1988, after 42 years of public service for Cook County, Illinois. Mario Tonelli’s indomitable spirit persevered through the darkest trials of his life. Even after he returned home from the war, he continued to serve others as a public servant. Mario “Motts” Tonelli died in January 2003, a hero to his community and country.